Island Time, A Perspective on one of Med One’s Unique Customers. A Perspective on one of Med One’s Unique Customers. Most Med One to One readers understand that a significant majority of Med One’s lease customers are acute care hospitals. This concentration and focus is by no means accidental. The acute care space has always been a solid and comfortable niche for our company, and our go-to-market strategy reflects this, from the types of equipment we typically lease, to the industry events we attend, to the way we fund our lease business. With all of that said though, Med One could not truly claim to be flexible and creative without seeing value in and supporting other healthcare related customers as well. Many of our best vendor partners sell to non-hospital customers which gives us an opportunity to work in other areas on occasion. The network of equipment suppliers and healthcare providers we have built over the years has often led us outside of our niche to unique and even unexpected customers that we never expected to have access to. One such customer that Med One was introduced to about 3 years ago is an air medical service (AMS) company called Island Air Ambulance. As Island Air Ambulance looked to expand and improve its air ambulance service with new life support equipment (ventilators, infusion pumps & patient monitors), they came to Med One to find both the equipment they needed to acquire, and ultimately to finance it as well. As I’ve worked with and have gotten to know the Island Air Ambulance team, I’ve gained a much greater awareness and appreciation of the vital role that air ambulances play in the delivery (very literally) of healthcare to patients being flown from the San Juan Islands, WA area to hospitals on the mainland – greater Seattle area. Over the past few decades due to the patient volumes needed to sustain costs of specialization and critical care, specialized medical services have become more and more centralized into highly populated areas, which means access to healthcare for rural and remote areas has diminished significantly. The harsh reality of some critical and specialized medical services is that they’re expensive to maintain. From personnel, to equipment and facilities, the inbalance of high costs and low patient populations make specialized and critical care services unsustainable. Critical services and specialists once widely available in communities large and small have thus essentially disappeared from rural America. With that change in access, AMS has become a key component of the American healthcare system. Approximately one out of every 1,000 people in the United States benefits directly from AMS each year. With AMS at work, lives are saved every single day. It’s availability also helps critical care patients regain productivity—reducing the likelihood that such patients will suffer long-term disability as a result of injury or illness. Emergency air medicine does so by transporting patients with emergency needs to a higher-level medical resource within the right amount of time so the best possible care can be administered and optimal recovery realized. The entire healthcare system runs more efficiently because AMS not only saves the lives of patients but, contributes tremendously to keeping patient volumes high. This in turn helps sustain the cost of maintaining specialized care in large urban hospitals. Emergency medical air transportation can also quickly take key resources like blood supplies or equipment and even specialty medical staff to a remote area when patients cannot easily be moved. In Island Air Ambulance’s case, the service they provide to their remote island region is imperative; more so than most AMS providers. Based in Friday Harbor, WA, Island Air Services is part of the San Juan Islands, a group of several hundred islands (172 of which are named) located between Vancouver Island, Canada, and mainland Washington State. Only four of the San Juan Islands (San Juan, Orcas, Lopez and Shaw) have access to ferry service from mainland Washington (a minimum 60 minutes) and not surprisingly, those same four islands have most of the population which is under 17,000 in total. With such a small population, to say that Island Air Ambulance provides an essential role in patient access to emergency healthcare for this group of Islands is a huge understatement! By air, level one trauma centers in Seattle are 30 minutes away. 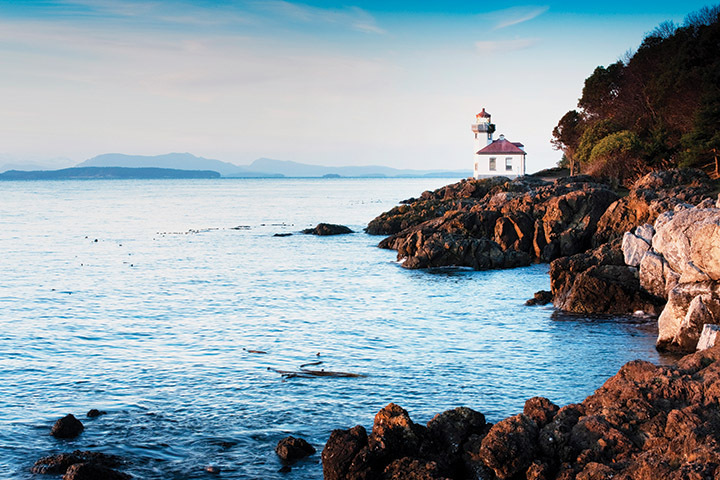 With other coastal cities like Bellingham there is an even shorter flight time. From the time I started talking with Island Air Ambulance to when we booked a lease with them, I have been intrigued by the company but also by the San Juan Islands. I’ve been itching to pay them a visit, lucky for me that opportunity came this past August (2018). To get there I took a 30-minute flight from Seattle on a 10-seat airplane directly to the Friday Harbor airport. Once there, I was finally able to see first-hand the Island Air headquarters and meet the great people that I’ve gotten to know by phone and e-mail the past few years. There are no traffic lights anywhere on the San Juan Islands and the only sign of any traffic congestion is when the ferries land periodically each day to drop off and pickup vehicles. We drove around the entire island in about 90 minutes (excluding a few stops to check out scenery and historic spots) and hardly encountered another vehicle while actually driving. Without hesitation I’ll say San Juan Island is one of the quietest, most peaceful places I’ve ever visited and the thought that kept coming to mind throughout our visit was how charming it was! For anyone looking to truly get away from the noise, crowds, traffic, and typical industrialization of big city life and simply unwind a bit, the San Juan Islands are a great option! Orca sightings are very common with plenty of whale watching tours, kayaking, and charter boats to choose from. With large and scenic boat harbors at each end of the island (Friday Harbor to the East, and Roche Harbor on the West) and an evergreen forest in between, it makes sense that all aspects of seafaring dominate the culture and economy. Friday Harbor has an abundance of unique restaurants but no chains, and no “fast food.” Lodging consists of small hotels and B&B’s, again with no chains or name-brand hotels anywhere in sight. The only hospital located in San Juan County is a new 10-bed critical access facility located next to Friday Harbor airport. Their services are vital in the diagnosis and decision making of transports. They decide if patients can remain on the island for treatment or if they need to be medevac’d instead. The role of Island Air Ambulance is essential to San Juan County and resident access to emergency medical care. My visit provided a wonderful and insightful perspective on the unique circumstances that have made Island Air Ambulance a successful and essential business in this area. Jackie and Will Hamilton who run Island Air told me that their business is the largest female owned airline in the United States. As a pilot herself, it’s clear that Jackie’s passion for aviation has driven the success of their company for nearly 30 years. Will told me that Jackie, 9-months pregnant, even flew herself to a hospital in Seattle to deliver her baby! A few years later when their son was in school, they wanted to switch him to a different school — located on a different island, so they flew him every day to and from school (a 10-minute flight). I enjoyed interacting with the Island Air team in-person, learning about their islands, their business and their passion for aviation. It’s always great to see successful entrepreneurship in action since that same spirit has been the driving force in Med One’s progression over the years. Successful entrepreneurs seem to have a unique ability to blend their passions, talents, work ethic, innovation and risk tolerance into a viable business opportunity. All over this land of opportunity that we call America, such businesses exist both large and small filling important and even essential roles. Entrepreneurs who see an opportunity to put their passions and talents to work go beyond a mere dream to build something great. Their efforts and passion impact market places, industries, communities, and ultimately individual lives. Island Air Ambulance has done all of these things and more and it’s a pleasure to know and work with them.